SEAL BEACH, Calif. - Oct. 16, 2014 - PRLog -- Coyote fight heats up. Native Americans joined Wild Life Activists to save the Coyotes in Seal Beach, CA. 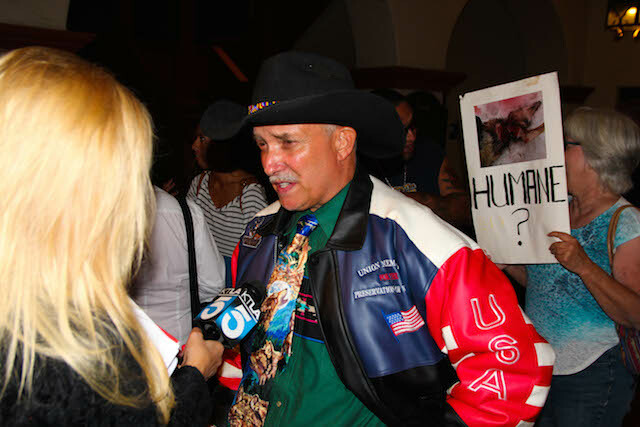 Union Members for The Preservation Of Wild Life brought many activist groups, educators, and community together to challenge the City of Seal Beach to stop Coyote trapping. Seal Beach City Council voted to continue trapping. Apache Runninghawk Daklugie chanted to the drum beat as he prayed for the protection of the coyotes. Apache Runninghawk Daklugie is a spiritual adviser from the Mescalero Apache Reservation in New Mexico. Three coyotes were trapped and euthanized in the first week of Seal Beach’s effort to combat what many residents consider to be a growing threat, officials said Monday. Trapping is scheduled to continue for at least three more weeks, officials told the City Council in a report at its Monday night meeting, where wildlife activists showed up in force to oppose the measures. Residents and city leaders in recent months have raised concerns about coyotes, which have been blamed for attacks on pets and appear to have become increasingly bold. The council in September approved a plan to trap and euthanize the wild animals. City Manager Jill Ingram said three coyotes had been captured at three undisclosed locations. She said trapping will continue for another three weeks, then the area will be evaluated by Long Beach Animal Care Services, the trapping company and city staff to determine if more is needed. “The only way we’re going to know (if trapping is successful) is based on the amount of activity in terms of attacks and sightings, and that’s something we’ll continue to evaluate over the next couple of weeks,” Ingram said. Ingram and other city officials consider trapping a short-term solution to urbanized coyotes, compared to more long-term methods such as teaching residents about coyotes and how to haze them to scare them off. “A couple of days after the vote, I started looking into it because I had, no exaggeration, 14,000 emails on my computer telling me I was wrong,” Levitt said. Levitt proposed putting the trapping on hold and to try an “advanced hazing” method, such as hiring trained professionals to shoot paint balls at the animals, before initiating the trapping period again. His proposal didn’t receive support from the other council members. Statistics gathered last month by Long Beach Animal Care Services showed that sightings in Seal Beach rose from 17 in all of 2013 to 99 this year as of Sept. 11. The number of attacks on pets jumped from seven last year to at least 12 through Sept. 11. Officials from the California Department of Fish and Wildlife, the Naval Weapons Station in Seal Beach and Long Beach Animal Care Services have been discussing coyote education and safety with Seal Beach residents since last year. The city’s coyote subcommittee is also developing a coyote management plan that the city can refer to for short- and long-term solutions, city officials said Monday.